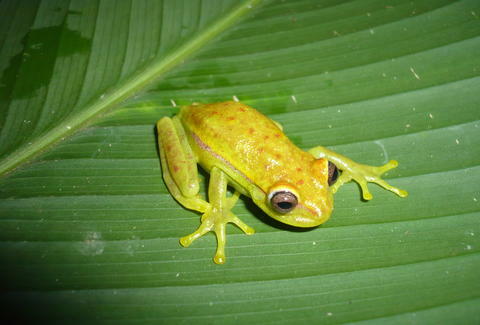 Many exotic frogs have a reputation for being quite literally psychedelic, in the sense that licking them might induce some hallucinogenic high. And now at least one of them seems to have the looks to match, as scientists just discovered the world's first glowing, fluorescent frog species. At first glance, the South American polka dot tree frog looks like your run-of-the-mill amphibian, but it turns out that it glows bright blue and green like a dorm room Grateful Dead poster under ultraviolet light, as a group of university scientists doing field research in Argentina recently realized after shining them with a black light hoping perhaps the creatures' tiny dots might be moderately fluorescent. To their delight, the frogs' entire body emitted a significant glow. As the researchers outline in their paper on the discovery, fluorescence is fairly common in sea life like corals, fish, sharks, and at least one species of sea turtle, but it's actually an incredibly rare trait among land animals -- the only other terrestrial creatures known to fluoresce are parrots, and some types of scorpions. 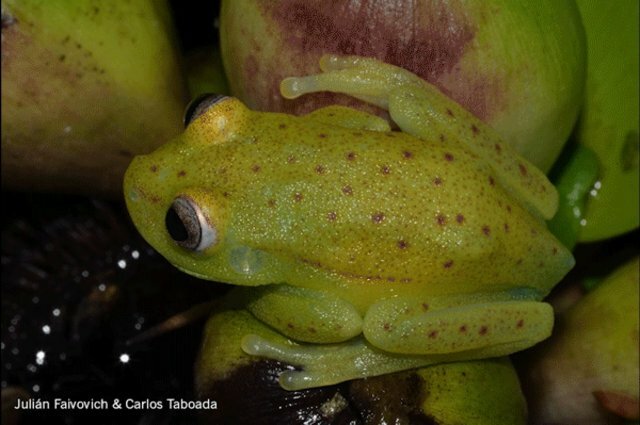 It's also unclear what what exactly the purpose of this unique trait may be for frogs in the wild, whether its a way for them to attract attention from mates, a camouflaging technique, or otherwise, but the scientists hope to conduct similar ultraviolet light tests on hundreds of other tree frog species in hopes of learning more. Joe McGauley is a senior writer for Thrillist who advises against licking strange frogs.